We live in a society preoccupied with ‘success’. In fact, most of us spend our entire lives chasing success. 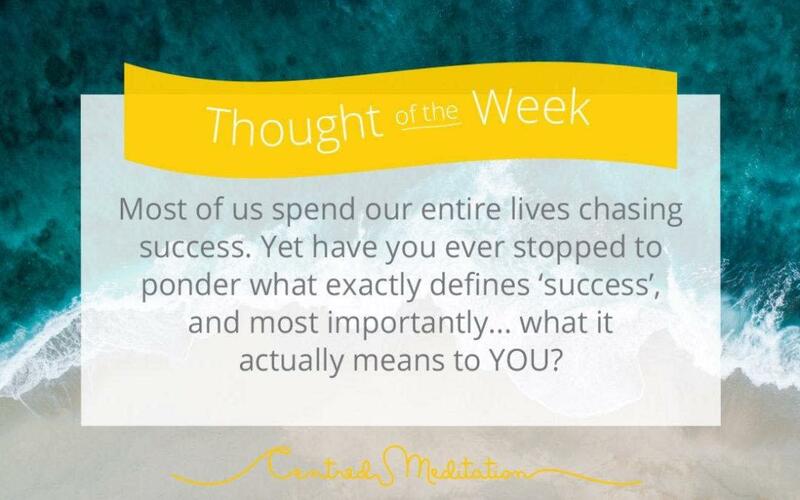 Yet have you ever stopped to ponder what exactly defines ‘success’, and more importantly – what it means to you? The Merriam-Webster dictionary defines success as: “the fact of getting or achieving wealth, respect, or fame”. For us, this definition raises so many questions…How much wealth? Respect from whom? Famous to who? Will we truly be content when we have an agreed upon amount of wealth, respect, and fame, and are these really even the markers for a happy and ‘successful’ life? We hate to break it to you, but we certainly don’t have all the answers. Besides, even if we did, they shouldn’t concern you. All that matters is what you think about it all. So we encourage you this week to take a pause and have a long hard think about what version of ‘success’ you are chasing and if the criteria you have set up for yourself is a) even achievable or b) worth achieving. To get you started, we thought we would share with you our favourite story of all time, which forever changed the way we perceive ‘success’. Enjoy! There was once a wealthy businessman from the city who was sitting by the beach in a small village. As he sat, he saw a local fisherman rowing a small boat towards the shore having caught quite few big fish. “Then why don’t you stay longer at sea and catch even more?” The businessman asked astonishingly. “This is enough to feed my whole family,” the fisherman answered. The businessman was taken aback and decided to offer a suggestion to the fisherman. “I am quite a successful businessman, and I’d like to offer you some expert advice. From now on, you should spend longer at sea to catch more fish so you can sell them in the village”. The businessman answered, “Then, when you have saved enough money, you can buy a bigger boat and catch even more fish”. The fisherman smiled and thanked the businessman for his advice, before happily returning home to enjoy playing with his kids. Excellent place for guided meditation. The guides are all very friendly and keep to time so I never have to worry about getting back to work. Helps me greatly with improving my concentration and just overall wellness of mind! I have recommended it to many and will continue to do so! Signing up for their two week into offer was probably one of the best decisions I’ve made so far - the place is so nice, with large comfy arm chairs, blankets, free tea, filter water and coconut water. Plus the guided meditation was amazing! I felt so much more relaxed and grounded afterwards as well.